I’ve just written this piece for The Conversation and because they publish all articles under a Creative Commons licence, I am able to republish it here. If you prefer, you can read it on The Conversation’s website here. You will have heard of the “antibiotic apocalypse” – the nightmare scenario in which we run out of treatments for bacterial infections because too many bacteria have acquired antibiotic resistance. It has been the subject of a major documentary and endless books and articles. David Cameron, when prime minister of the UK, commissioned a major review on the subject, led by the distinguished economist Lord Jim O’Neill. England’s chief medical officer, Dame Sally Davies, warned that the apocalypse may already be upon us. I discussed it at the Edinburgh Fringe recently as part of the Cabaret of Dangerous Ideas. Being able to diagnose bacterial infections more quickly is seen as a key to the problem, as highlighted in the ten-point plan in O’Neill’s final report in May. At the moment, diagnoses take a number of days. If we could do them in minutes, it would reduce the need for “just in case” antibiotics and ensure that the correct antibiotic is given for the infection. It would also mean we stopped using them to treat infections caused by viruses. Use fewer antibiotics and it would reduce the pressure on bacteria that results in them developing resistance. This would help our already limited range of antibiotics remain effective for longer. To incentivise the research community, the UK government set up the £10m Longitude Prize a couple of years ago. So how are we getting on? To give a sense of the challenge, take Salmonella. This bacteria can frequently cause gastroenteritis (food poisoning) from people eating contaminated meat, eggs and chicken, among other things. 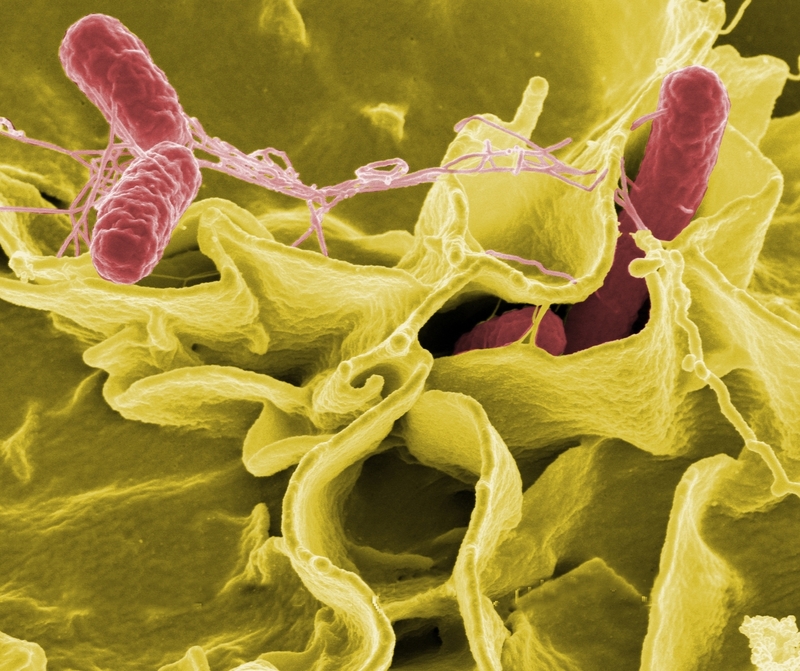 In some countries, different types of Salmonella can cause more serious infections such as Typhoid fever. This can be life-threatening to the elderly, newborns and those with defective immune systems – another reason why rapid diagnosis is important. In the UK, clinical laboratories identify bacteria that cause infections according to the Standards for Microbiology Investigations (SMI). For Salmonella, the standard practice is to do four tests. You start by growing a bacterial culture from a sample of blood or another bodily product in a petri dish – this scales up the bacteria and makes it easier to identify. Next the technician has to first analyse the bacterial cells under a microscope; then mix Salmonella-specific antibodies with a blood sample to look for signs of clumps forming (agglutination); then carry out biochemical tests that identify bacteria by revealing what kind of enzymes they possess. Before any of this can begin, a patient needs to present at the clinic or hospital and provide a suitable sample. This may be a number of hours after the onset of infection. Growing a culture can take at least 24 hours. The microscope study and the agglutination only take minutes, but the enzyme testing will take another 24 hours. Sometimes another prior step is necessary to make the bacteria easier to identify. In a blood sample, for example, bacteria might be present in low numbers which can affect test sensitivity. Or where it’s a faecal sample, there will be other bacteria present which could affect the sensitivity of any tests done. This extra step can involve various ways of enriching the bacteria – for instance subjecting the sample to conditions that will favour the bacteria in question to the detriment of others. This will normally add another 24 hours. Put everything together and you’re talking about between two and five days from infection to diagnosis. Other more rapid tests that have become possible in recent years. Nucleic acid amplification tests (NAATs) can identify bacteria based on the presence of their specific DNA within hours; and MALDI-TOF mass spectometry can identify bacteria in minutes from the protein components of their cells. Yet these require specialist equipment that is too expensive for many laboratories. Both still require a cultured sample, which again adds 24 hours. And NAATs in particular have limitations which can produce false results and inaccuracies. So where do we go from here? The Holy Grail is something analogous to a pregnancy test in terms of simplicity and speed. Such a test could be administered by a doctor or nurse at the point of first consultation and provide a diagnosis before your appointment is finished. There is precedent for rapid disease diagnosis with the release of a self-test for HIV, where you can obtain a result in about 15 minutes. Producing an equivalent test for bacterial infection is more complex, however. Where the HIV self-test works by detecting HIV antibodies, with bacterial infection it can take time for antibodies to be produced while the onset of symptoms can be rapid. Some bacteria are also covered in molecules which can fool the immune system so that no antibodies are produced. Another hurdle that would need to be overcome is that any test would need to be able to distinguish the bacteria causing the infection from the harmless bacteria we normally find in the body. ‘I told you I’d be quick’. In short, the development of a new rapid method of diagnostics is by no means an easy task. I think it unlikely that either MALDI-TOF mass spectrometry or NAATs are the answer. In my laboratory we are trying to use our knowledge of bacterial physiology to think beyond these methods to design microbial sensors that can detect the harmful bacteria, but without the need for culture. I am aware that others are exploring developing a diagnostic that can sense whether an infection is present by identifying specific molecules produced by the body in response to infection. Either way, I am optimistic that we will find a solution within the next five to ten years, and that it will come from a multidisciplinary approach from scientists, engineers and industry working in partnership. With £10m Longitude Prize on offer too, it’s a great incentive. For most working towards this, however, the real reward will be contributing to averting one of the most serious threats that humanity currently faces. Previous Post Soapbox Science comes to Edinburgh!